This review is cross-posted from the original review at BookLust. I have been inspired this year to read many books on the women's experience. I also have been downloading a bunch of free books to my Amazon Kindle because I don't have any physical books with me in New York. These two criteria combined in fortuitous circumstances recently, making me aware of the book Letters of a Woman Homesteader, a collection (available for free online!) 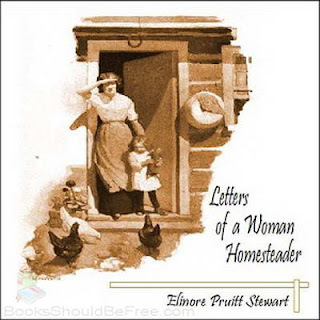 of letters written by Elinore Pruitt Stewart about her first several years homesteading in Wyoming at the turn of the 20th century. This book was fantastic! It's similar to the Little House series of books, except for adults. Elinore (I should probably refer to her as Stewart, but I felt such a connection with her that I'm sure she wouldn't mind me using her first name) has such an engaging way with words. She is one of those people who writes her letters with a very distinct and fun tone, making you feel like she is right there with you telling the story. I think her personality shines through in the letters and she is just so fun and bright and optimistic that it was a delight to spend time with her and her family and get to know her better. Almost every time I read a book set at the start of the 20th century, I am amazed at how much has changed so quickly. Elinore did so much stuff. She grew a garden, she milked cows, made preserves, raised three children, took unplanned trips, helped deliver a baby and shot and skinned her own dinner. Very early on in the book, she describes taking her daughter Jerrine (an unfortunate name, to be sure) out in the morning because she just wanted to take a trip. They just saddled up their horse, took a gun and a pan, and then set out into the wilderness for a few days, living on the land. I can't imagine just getting up and doing that, mostly because I have no sense of direction. I am continuously amazed by how these isolated homesteaders found each other, out there in the forests and mountains. And then, after finding each other once, managing to do it again without any roads or distance markers or ways to call for directions or anything. I get stressed out if I can't find a subway station. So yes, Elinore is a very independent woman, and it's so fun to go on adventures with her. She makes it seem as though she lived in a bustling town, full of daily visits from friends and all sorts of interesting trips to keep her occupied. In reality, though, her letters are written months apart, and I'm sure that much of the time, she and her family were pretty isolated. She seemed well able to occupy her time, though. What also stood out to me was how the concept of education has changed. Elinore says that she is uneducated, never having finished school. But even though she lived in a city as an adult (not sure where she grew up), she knew how to plant vegetables, harvest flowers, mow the lawn (using a horse! ), shoot and pluck a bird, cook and preserve food, sew clothing and a host of other things. It bothers me that even though she had so much knowledge in those things, she was still considered uneducated. I think we really need to change our definition of the word to include people like Elinore, who are almost entirely self-sufficient. I admit that in reading these letters, I wasn't sure how much was true and how much was false. Elinore seems the sort who would exaggerate for the benefit of the story. I'm not complaining at all because I was thoroughly engaged in the story, but I did sometimes wonder if everything was true. At the same time, though, some events are not explained very well, or people are not introduced in a manner that makes sense, making it seem very much like letters being written rather than plots being developed. What was interesting is the way that Elinore would tell her friend that she would mention a story in a later letter- and then take months to write that later letter, describing the event. So there is a massive lag in event happening and story being shared. Elinore also only tells her friend about some pretty important events in her life very late in the letters (such as only mentioning her marriage about a year after it took place! ), which was surprisingly upsetting to me. It felt as though she was holding information back and if she would lie or just skimp on information in some things, what was to keep her from lying about other things? I wasn't sure, at the end of the book, if I actually knew what Elinore's life was really like or if I just knew about the life she wanted to project. My suspicions were only heightened when I learned here that Elinore claimed to be a widow but there are "indications" that her first husband hadn't died. She has pretty strong opinions on polygamy in this story, so it would be quite ironic if she herself had two husbands! But Elinore was such an evangelist for homesteading and for the state of Wyoming. She clearly loved her life, and made so many wonderful friends in the backwoods. I liked her so, so much that I was always taken aback when she said something upsetting, usually a glancing reference to race. It bothers me that someone I came to like so much, and who was so kind and generous to her friends, might not be very likeable or kind or generous to people who were not white. I think that is a struggle I often have- it's hard for me to see that someone who is so good and sweet at heart and always hope for the best could at the same time think that there exists a racial hierarchy. It's not as though Elinore ever says anything outright that could be offensive, and I know that the N-word was used differently in the past, but I got the feeling that she wasn't exactly fighting for civil rights, and it saddened me. But I don't want to leave you with a sour taste in your mouth. I thoroughly enjoyed reading this book. In a way, not quite trusting Elinore through the story was a great lesson in history. We tend to take primary sources as pretty strong evidence, but when letters are being sent over many miles, many months apart, to someone you know you'll never see again...who knows? I was delighted to find that this book has a sequel that is also available for free download! It's called Letters on an Elk Hunt, and I have already downloaded it and am looking forward to once again spending time with Elinore and her friends. Click here for a taste of Elinore's writing style (and an audio recording of one of her letters, as read by someone else). The full text of her letters is available on Amazon and here.